Jesse Jones: Very few Houstonians did so much for our great city than Jesse Holman Jones. Yet until the completion of the Jesse Jones Memorial Bridge on Beltway 8 over the Houston Ship Channel there was no road, street or alley named for this modest giant. It is impossible to list his accomplishments in a paragraph (read Jesse H. Jones: The Man and the Statesman by Bascom N. Timmons). He was an entrepreneur, visionary, real estate developer, banker, businessman and politician. He helped us get the Ship Channel, built the Texas Company building, was chairman of the National Bank of Commerce, owned the Houston Chronicle and was an early stockholder in Humble Oil & Refining (now Exxon). He and his wife, Mary, started Houston Endowment. During the Great Depression he was chairman of the Reconstruction Finance Corporation and Federal Loan Agency. He served as Secretary of Commerce during President Roosevelt’s third term. Jones died in 1956 and is buried in Forest Park Lawndale Cemetery. Katex: Located west of Houston this street is the combination of two words: Katy and Texas. Katy Mills: About 25 miles west of downtown Houston this street leads to a 1.3 million square foot retail and entertainment complex named Katy Mills. It is basically an outlet mall on steroids with huge stores like Bass Pro Shops Outdoor World where you can buy anything for the outdoorsman. Kelly Courts: This near eastside street leads to a public housing project named Kelly Courts. In 1942 it was named for A. K. Kelley although the powers that be at that time misspelled his name. Kennesaw Mountain: Around 900 A.D the inhabitants of this mountainous area northwest of Atlanta were known as the Mound Builders. Their descendents became the Creek Indians. On June 27, 1864, 100,000 Union troops under the command of Major General William T. Sherman faced off against 65,000 Confederates under General Joseph E. Johnson in what historians call the Battle of Kennesaw Mountain. Although Sherman failed to defeat Johnson, this skirmish did little to slow the Union army’s march to Atlanta. Kingwood Medical: This north Harris County street leads to the Kingwood Medical Center. This 155-bed acute care hospital has been offering Kingwood residents inpatient, outpatient, surgical and specialty services since 1991. Knigge Cemetery: This small burying ground contains the remains of several members of the Knigge family including Gottlieb (1862-1936), Minna (1857-1901), Saul (1825-1894) and Johanna (unreadable dates). The cemetery remains in use today with graves as recent as 2003. Kobayashi: Mitsutaro – This Japanese rice farmer arrived in Webster, Texas in 1906. He was very successful in his agricultural ventures. In 1913 he asked his family in Japan to send him a bride. Moto Shigeta, daughter of a prominent whale oil dealer, arrived and the couple was married. She was renowned for her skills in flower arranging, calligraphy and poetry. Moto also had a reputation as an excellent cook. Koinm: J. H. – It is possible that this street near George W. Bush Intercontinental Airport is named for this man, as the Koinm Family Cemetery is located nearby. Kuhlmann: Johann F. – In the 1880s this man and his family lived in the area we now know as Riverside Terrace, east of Hermann Park. Lorrie Lake: In the Memorial neighborhood of Sandalwood there are two lakes. In the 1950s the developer named them and the streets for female family members Lorrie and Robin (Robin Lake). Patti Lynn is also named for a family member. Luella: Deer Park founder, S. H. West, named most of the early streets in this Ship Channel town. In this case the street recalls his youngest daughter. It is one of only three still on the map that he named. The other two are P and X Streets. Center was originally named West but changed later The Shell Oil complex covers the majority of the early Deer Park streets. Magellan: Ferdinand – Located in the maritime themed neighborhood of Newport, this street honors one of the greatest seaman and navigators in history. Among his many accomplishments: he initiated the first circumnavigation of the world, discovered the Straits of Magellan, named the southern tip of South America Tierra del Fuego (because of the many fires he saw there) and named the Pacific Ocean. Magellan was born in Portugal in 1480. At 15 he joined the Portuguese navy where he excelled. In 1513 he had a falling out with King Manuel, renounced his citizenship and became a Spaniard. Charles V of Spain knew a good thing when he saw it and commissioned Magellan to sail around the world. His fleet of five ships departed August 10, 1519. It was a difficult expedition. Magellan was killed by islanders in the Philippines on April 27, 1521 but one ship limped home with a crew of 18 to complete the voyage. UPDATED McKee Street: Ann Price Mazoch, the great granddaughter of Jethro “Jessie” McKee Jr reports that many McKees lived in the area where this street and bridge are located from the 1850’s on and it’s probably named for William R. McKee. The 1850 Houston map shows McKee Street north of the bayou and Gabel Street (later changed to McKee) south of the bayou. The 1890 map shows the Crystal Ice Works and several other landmarks near McKee Street. In Louis F. Aulback’s book, Buffalo Bayou, he states that the Crystal Ice Works was built on the site that had been the home of Mrs. E McKee as late as 1869. This home could be the home of Jethro McKee (Sr) and his wife, Frances Elizabeth “Bettie” Ritchie McKee and their children, William, James, Katherine and Jethro “Jessie” Jr. The 1884 and 1886 Houston City Directories show that William McKee and his wife “Nellie” Hellen White McKee owned a grocery store at the corner of McKee and Liberty streets. 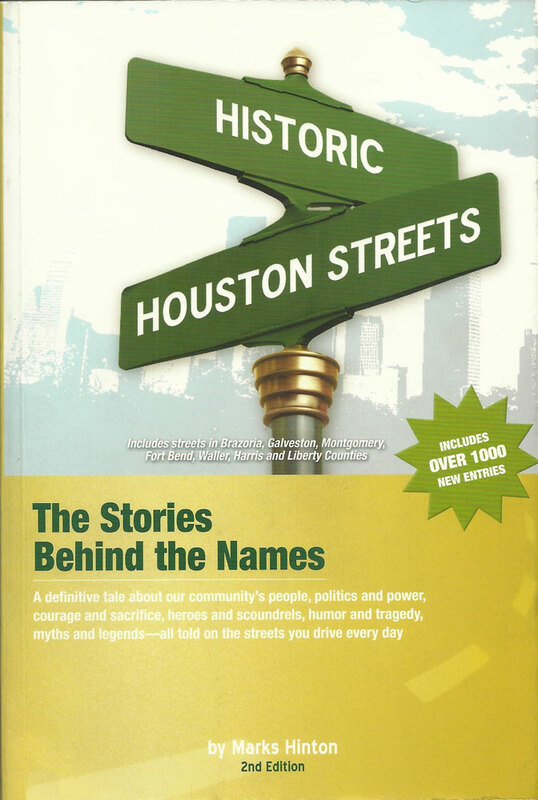 In 1880, they sold some property to Henry Henke (see page 148 of Historic Houston Streets, 2nd edition) for his Fifth Ward Grocery located at 1200 Rothwell (also called Nance) which is near McKee Street. This sale was confirmed by Sears-Crawford LLP and the Archaeological & Historical Commission hearing and both state that McKee Street and McKee Street Bridge are named for W. R. McKee. Meyer Park: This street and park are named for Elizabeth Kaiser Meyer. Millie Bush: To the best of my knowledge this street is the only one in the Houston area named for a dog. Millie Bush (who is also remembered by the 13-acre Millie Bush Bark Park in Barker Reservoir) was “First Dog” during the administration of President George H. W. Bush. First Lady Barbara Bush chronicled this Springer Spaniel’s life in the White House in Millie’s Book in 1990. In 2005 this dog park was named the best in America by Dog Fancymagazine that rated over 700 of this type of facility. Mink Lake: This Montgomery County street leads to a small lake of the same name. Minks are semi-aquatic carnivores that were in evidence when the first settlers arrived in this area in the mid-1850s. They were hunted for their luxurious pelts that were subsequently turned into coats and hats. Mt. Carmel: This southeast side high school was founded by the Order of Carmelites in 1956. Since its creation over 5,000 students have graduated from this institution. In 1986 the Diocese of Galveston-Houston assumed ownership of the school. It has an interesting Latin motto – non licet nobis esse mediocribus or “it is not permitted to be mediocre.” Your author competed against students from Mt. Carmel in football and track from 1957 to 1960. Mueller Cemetery: Founded in 1896, this cemetery contains the remains of several early German settlers including the Muellers. The earliest grave stone here is that of Emilie Mueller who was born in Prussia in 1838 and died in Harris County in 1896. Her husband, Johan Friedrich Mueller (born 1832), who is also interred here, lived to the ripe old age of 88 years. Mueschke Cemetery: Located near Westfield, this street leads to this small cemetery. Like other burial grounds in this area many of the people emigrated from Germany. Names like Hildebrandt, Kaiser, Krimmel, Mittlestedt and Tautenhahn abound. The final resting places of two members of the Mueschke family (Olga and Paul) are here as well as John S. D. Armstrong, a Confederate soldier. The earliest burial I could find was Maria B. Meyers (March 20, 1891). Murphy Road Mobile Home – Located in Stafford, Texas this road leads to a mobile home park. Ojeman: In the Borgestedt Cemetery off Huffmeister Road there are a number of persons interred with the sir name of Ojemann. It was not unusual for immigrants to alter the spelling of their names after arriving in America. I believe this is the case here since the street and cemetery are not far apart. Family members buried here include Fred (born 1884), Emma (b. 1884), Edna (b. 1913) and Marie (b. 1914). Park Place: This southeast side neighborhood was developed in the 1930s by Park Place Company who named this main thoroughfare for the corporation. Paul Quinn: William Paul Quinn was the fourth bishop of the African Methodist Episcopal Church. Paul Quinn College, the oldest black liberal arts college in Texas, was also named in his honor. It was founded in Austin in 1872 for the purpose of educating former slaves in industrial skills such as blacksmithing and carpentry. In 1990 the school moved to Dallas taking over the former campus of Bishop College. Perkins: The Perkins Development Company developed Trinity Gardens where this east side street is located. Among their other projects were Bonita Gardens, Burbank Gardens, Colonial Gardens and Kashmere Gardens. Petrich: The Petrichs owned land where this northwest Harris County road is located. Their family cemetery is also here. Piper: It makes sense that a road adjacent to an airport would be named for an airplane. William Thomas Piper developed this light aircraft in 1937. The Piper Cub was originally designed for flight training but the USAF bought 5,677 for observation planes during World War II. After the war it became very popular with civilian pilots. Pitching Wedge: This is a golf club. This wedge is characterized by a high loft (typically 45-60 degrees) to increase trajectory and significant sole weighting to help on grass. It is also heavier than the typical iron. Post Oak: The post oak (also known as the cross or iron oak) occurs in all areas of Texas except the High Plains and the Trans-Pecos. It can reach 75 feet with a dense, rounded canopy. The leaves have a distinctive cross shape while the bark is thick with plate like scales thus the other two names for this deciduous tree. NEW Preston Road: This Pasadena street was named for Preston Phillips, according to his daughter. When the area map was being platted, Mr. Phillips told the surveyor that the street had no name and he just called it “rocky road” because of the condition of the roadway as he drove his school bus along it. The surveyor decided Preston Road would be a better name.